Days like this are when I realize how fast time flies and how special each moment is. Today, I’m spending a few of the last days with Sampson, the caracal. At 17, he’s spent his entire life here at The Wildcat Sanctuary. He was our second resident and I remember him being a little ball of red fur and fire, hissing non-stop. 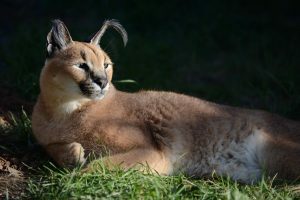 Over the years, we became very close and he was the most easygoing caracal anyone had ever met. 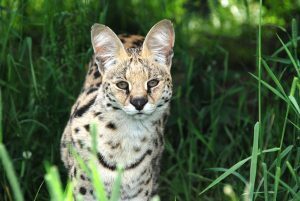 His best friend, Cleo the serval, was the first resident to call TWS home. 17 years has gone fast. I feel like it’s the end of an era. The original cats have been here from the beginning, since I had the first crazy notion that I wanted to make a difference in the lives of animals, but had no idea how I was going to do that. A day doesn’t go by that I’m not asked, “How did you start the Sanctuary?” Some of you have been on this journey from our inception in Atlanta. Others have joined the cause once you heard about our first tigress Meme. Others recently joined. Thank you to each and every one of you who has made mine and so many cats’ rescues possible. As a young girl, I was always eager – eager to do as much as I could in as little time as possible. Some would say I haven’t changed much. In high school, I started attending college when I was just 16. After high school, I double majored in marketing and advertising, graduating in 3 1/2 years while holding down a job. I knew I wanted to work my way up the corporate ladder as fast as possible in a creative advertising agency. I worked for a few smaller agencies before being recruited to The Coca-Cola Company in Atlanta. I was the youngest in their marketing department and the first to be hired without a Master’s Degree. Later in my career, I worked for many international, high profile companies, too. I was introduced to exotic cats during my work in advertising and on photo shoots. On one particular shoot, there were two young Bengal tiger cubs named Titan and Tango. At first I was smitten, like everyone else. How cute and adorable they were. The cubs were on leashes, being pulled in many directions. They started screaming when they got tired, but their job was not over, so the trainer kept redirecting them to stay on cue. After that, I decided to volunteer for a few organizations only to find out they were breeding and selling. Each time I volunteered, a favorite animal would be gone and a new one would appear. I never got straight answers. Once, an owner wanted to prove to me he did nothing wrong and asked me to accompany him to pick up a baby cougar. What I saw that day, I’ll never forget. Metal corn cribs cut in half, turned on their side to create an 8 x 12 space no higher than 5 feet at the tallest point. On one side was a severely scarred leopard with fur missing and flattened feet due to a declaw. The owner said the leopard had been in the house when she was younger and been burned by boiling water. I looked to the right and tears welled up in my eyes. There was the male lion I’d loved so much, that I’d volunteered to care for at the other facility. He’d been traded for the cougar kitten we were picking up today. He could barely turn around in the small space, his face was bloody from scraping the fence and his paws were raw from the hard surface he paced on. He was a shell of the cat I’d met before. But that wasn’t the worst. We went into a pole building that had dozens of small galvanized boxes with round holes. They were no bigger than a copy paper box. The only thing you could see were small eyes peering back from the round air holes. The sound coming from those boxes was deafening – the screaming and hissing, I can still hear it today. I was told they were all bobcats that would be electrocuted for their pelts. I was physically ill. Incredibly, the owner thought it would somehow bring me peace to see the lion I’d loved so much. To him, this was just a regular business transaction. That was one of many days I vowed to make a change, but I had no idea how. In 1999, I was contacted by a volunteer who was still helping one of the facilities I had volunteered with. She told me one of the adult Bengal tigers would no longer work on a leash and the trainer deemed him dangerous. The tiger’s reward for years of service and profit to the trainer was to be killed and taxidermied. I didn’t know how I could help from so far away, but I had to do something. My mom had given me a Parade Magazine featuring actress Tippi Hedren and her big cat preserve. I dialed the number in the article and, to my surprise, Tippi answered the phone. She committed to finding a sanctuary for the tiger if the trainer would relinquish custody. It had only been hours since the first phone call, but when I called back, the tiger had already been killed and put on dry ice. It began on two small acres in a suburb of Atlanta, then moved to five acres in the country. In the beginning, we purchased some cats trying to save them. But soon realized giving the “bad guys” any money at all was only contributing to the problem. Running a nonprofit was harder than I thought, so I moved back to my roots in Minnesota bringing our 10 cats to 10 new acres. 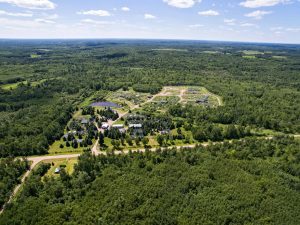 After a zoning dispute over a geriatric tiger I rescued named Meme, we moved north to 40 plush acres in Sandstone, MN where we reside today. For the first several years, I worked both a full-time job and also ran the sanctuary. I received no salary from the sanctuary and invested tens of thousands of dollars of my own money to build habitats and care for the animals. This is because it was, and still is, a labor of love. Over the years, I’ve acted as Executive Director, animal care director, keeper, construction manager, fundraiser, financial manager, and overnight caretaker of the facility. Often all at the same time. Anybody who has started a business understands the commitment and sacrifice it takes. Starting a sanctuary is no different, except there are 100+ animals whose lives depend on us. I have made my share of mistakes, but never wavered from the mission. Life came full circle as it often does. Just weeks after moving to our property in Sandstone, MN, we were contacted by authorities that Cynthia Gamble had been killed by one of her performing tigers just five miles down the road. I knew that property all too well. It had been years since I’d been there. My heart sank when I heard it was Titan and Tango – the two cubs that I’d met years earlier on the photo shoot. They’d been through so much through the years. 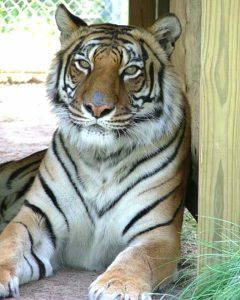 Another tiger, Lilly, was also on the property and had her own troubled past. All had been through starvation multiple times. Titan and Tango survived when 30 other cats perished in the barn from dehydration and starvation just a few years earlier. Tango’s fate was sealed by authorities who euthanized him after Gamble’s death. 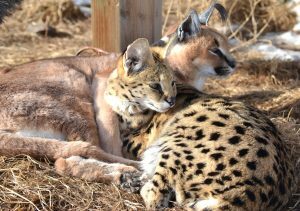 Thankfully, The Wildcat Sanctuary was able to offer survivors Lilly and Titan a home. Over a decade had gone by since I first met Tango and Titan. I made a new vow that no cat should ever have to withstand a decade of abuse and neglect before being rescued. And we would dedicate ourselves to inspiring change to decrease the number of cats needing sanctuary. Since 2006, with your help, we’ve built out 40 acres to provide natural habitats for rescued wild cats, added an onsite hospital to treat our ever growing geriatric population, built a talented and compassionate team, became a leader for change nationally through our advocacy work and supporting legislation to stop the breeding and ownership of big cats as pets, grew our onsite internship program to help educate future animal advocates, mentored other sanctuaries to expand the number of homes available to rescued cats and acted as placement officer to coordinate national rescues with dozens of big cats needing placement at a time. What you’ve helped us accomplish is amazing. I’m thankful for that daily. But still, on days like this, as I experience the last chapter in a very special cat’s life, all goes silent. It’s as if time stands still – or I just wish it to in order not to have to say goodbye. I know that Sampson is one of the lucky ones. Arriving at a very young age, he has never known the abuse or neglect many of our other residents have. He has only known love and kindness. But more importantly, he changed our lives. He was one of the first to teach us why wild cats should not be pets, why they need special care and deserve to live wild at heart. People say I’ve built a legacy, but it is their legacy. If I only make a fraction of the impact that Sampson and the other cats have made on me, then I’m very blessed. Because their legacy inspires change and only in their legacy can we end the captive wildlife crisis. It is the best way we can honor each and every one of them. For now, I choose to celebrate the very special days and weeks ahead as Sampson and other founding cats move to the next chapter in life. And with your continued support, we will also start a new chapter here at The Wildcat Sanctuary by welcoming new cats that need refuge who will be just a special as the first to call TWS home. Thank you for the past, present and future! You have truly made a difference in my life and all that call TWS home. 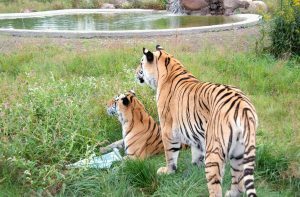 You can continue to make a big difference in the lives of big cats by including a gift to benefit The Wildcat Sanctuary in your will or living trust. Learn more about this easy way to provide a bright future for wild cats in need HERE or by calling me at 320-245-6871.